Search for the best flight prices from Manchester to Sofia. Compare prices, book today and save money with Manchester Airport. 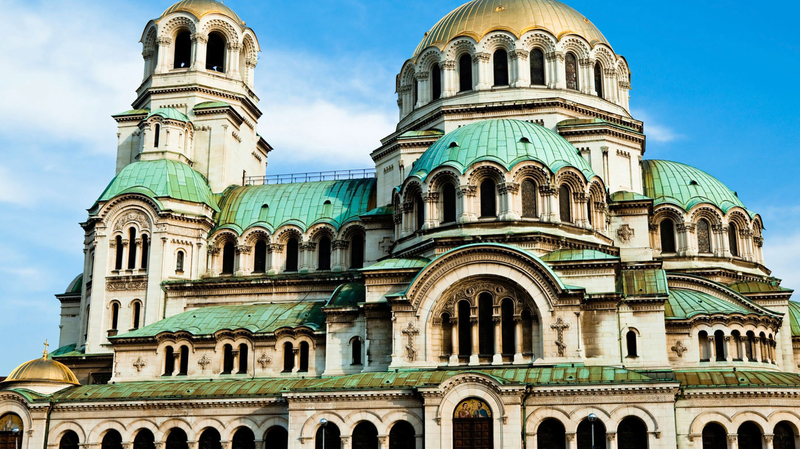 The booming Bulgarian capital is one of Europe’s very oldest cities, with an incredible 7 millennia of history. As a result, this cradle of civilisation has much to offer, from prehistoric settlements to beautiful royal palaces, including fine examples from the Roman, Byzantine and Ottoman eras. Travel there today and you’ll find a very European city embracing its role as the de facto hub of the south-eastern extension of the EU. The historic centre of Sofia is the best place to search for hotels, whatever the budget. Sofia Hotel Balkan (5 Sveta Nedelya Square) is perfect for those seeking out decadent old-world ambience, while the luxury Arena Di Serdica Hotel (2-4 Budapeshta Street) has ancient history right on its doorstep, with Roman amphitheatre ruins interred on its ground floor. Mid-range options include Crystal Palace Boutique Hotel (14 Shipka Street), which has a restaurant with a pretty terrace and a relaxing bar. If you're on a tight budget, Hotel Aris (1 Seliolus Street) punches well above its price range in terms of quality. For a gorgeous selection of traditional and contemporary ceramics and textiles, head to Traditzia (36 Vasil Levski Boulevard), which supports local minority and disabled artisans. The Centre of Folk Arts and Crafts (Battenberg Square) also sells good quality works, but these come with higher price tags. Sofia is full of bustling markets perfect for browsing: the Central Sofia Market Hall (25 Maria Luisa Boulevard) is the city's most famous, but the Zhenski Pazar (Ladies’ Market) between Ekzarh Yosif Street and Slivnitsa Boulevard is more atmospheric and stocks everything from fresh produce to pottery. The stalls thronging Alexander Nevsky Square are also worth a look for original art, traditional embroidery and religious icons. Bulgarian cuisine may not rate highly on the international foodie radar but you won't go hungry in Sofia. For an elegant fine dining experience, Panorama Restaurant (100 James Bourchier Boulevard) can't be beaten. There's not even a menu. You simply choose what you fancy as it flies past on one of the innumerable trolleys. For a more contemporary feel, Ego (12 Tsar Osvoboditel Boulevard) is a reliable option, while for traditional Bulgarian dishes, seek out Pri Yafata (29 Dondukov Boulevard). The Kanaal Beer Garden (2 Madrid Boulevard) is a top spot for a friendly beer with the locals. This showcase of world cinema and local Bulgarian film is one of Sofia's biggest annual events. It's a brilliant space to soak up big-screen culture with a series of discussions and Q&A sessions. This long-running festival brings wistful tones to the city twice annually. International big-name artists and up-and-coming jazz musicians perform at venues throughout the city with concerts covering the wide breadth of the jazz genre. Stars of the classical music scene perform a packed programme of orchestral, ballet and opera performances, as well as choral and chamber music concerts. This week-long celebration of contemporary visual culture brings together design professionals from across the world to participate in exhibitions, workshops, discussions and film screenings. International contemporary dance companies descend on Sofia for a program packed full of avant-garde performances. For those interested in more than simply being a spectator, there’s also a schedule of workshops and lectures to attend.